The Treasury yield curve gets flatter every day, and some strategists expect it to invert, meaning short end yields, like that on the 2-year note, could rise above longer duration yields, like the 10-year. A flat curve is the sign of possible economic weakness, but an inverted curve signals recession and the point where the curve would invert was just 25 basis points away Friday, the lowest in 11 years. Fed Chairman Jerome Powell could be asked about the curve next week when he testifies before Congress, and one strategist says: "the bond market is sounding the alarm, but the Fed is not going to be running to what it perceives to be a false alarm initially, even if things go up in smoke." The U.S. economy is more vibrant than it has been in years, yet the bond market insists a recession could be on the horizon. Some market pros say that warning from the Treasury yield curve, which has long been viewed as reliable, is not as relevant as it once was because of the long years of central bank easing that has depressed interest rates and turned debt markets into far more placid arenas. The curve has been getting flatter by the day — meaning short-end interest rates are rising faster than long-term rates, and they are growing closer together. A flattening curve is a warning about economic weakness ahead, but should the curve invert— where the short end yield, like the 2-year, is actually higher than the 10-year—that would be viewed as a very solid recession warning. On Friday, the gap between the 2-year yield and 10-year yield narrowed to just 25.5 basis points, a new 11-year low. However, many in the markets are taking the message seriously. Joseph LaVorgna, Natixis chief economist Americas, said the flattening curve is sending a warning, and many investors will see it that way. The financial sector is among the first areas to be pinched when the curve inverts. “In general terms, if your cost of funds is 3 percent, and the return on your lendable funds is 2.5 percent, you’re not going to make money. You’re going to lose money. What happens is when the curve flattens and then inverts, you disintermediate the financial system…which means people are going to borrow and lend less,” he said. Goncalves said some banks would start to feel the pinch, but in the two years before the financial crisis, after the curve inverted, they were still making money. “During that time, there was a lot of creative financing that was happening. That ended up causing other issues but banks were profitable during that time period,” he said. The inversion, or the flipping, of the yield curve has certainly preceded recessions, but the timing of the onset has not been very consistent and has been as quick as a few months or as long as two years. 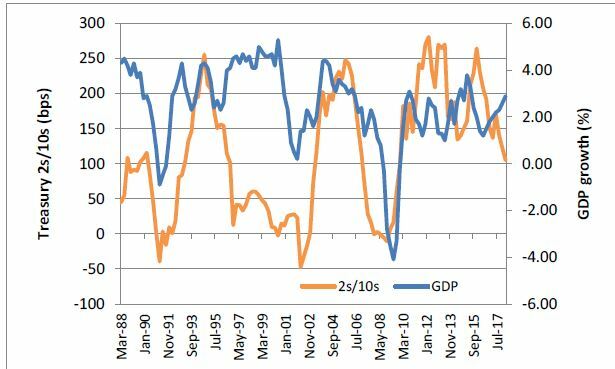 “The time frame between inversion and recession can be quite extended. The economy can stay in positive territory, and the markets as well,” said Leo Grohowiski, CIO at BNY Mellon Wealth Management. The time between the curve inverting and recession has varied dramatically to as little as a few months to as much as two years. Grohowski and others stress that this cycle may be very different, particularly given the actions of the Federal Reserve and other central banks since the financial crisis. The long end of the curve, for instance, has been artificially depressed by global rates, with German 10-year bunds yielding just 0.34 percent. "It seems like every day it continues to flatten. it remains to be seen whether this a recession signal but I think it is a signal that the economy is going to soften," said Peter Boockvar, chief investment officer at Bleakley Financial Group. "Not every flattening yield curve led to a recession. To me, there's no mystery over the yield curve flattening. The rate hikes eventually lead to an economic slowdown. Of the 13 rate hike cycles since World War II, 10 put us into a recession. We've only had three soft landings." Certainly, Fed Chairman Jerome Powell will be asked about the curve when he testifies before Congress next week. The Fed is expected to raise interest rates two more times this year and three times next year. Analysts expect the Fed to stick to its hiking plans despite the curve. The economy in the second quarter is expected to have grown just under 4 percent, and is expected to remain strong through the end of the year with forecasts for the third and fourth quarter above 3 percent. The economy is being helped by tax law changes and fiscal stimulus but the bond market also worries that trade wars could lead to a slowdown and that has helped depress the longer end yields. "Inverted curves have always been lurking at the scene of the crime when there's a recession. It's more of a coincident indicator than a causal factor," said Jim Caron, fixed income portfolio manager and managing director at Morgan Stanley Investment Management. Caron said this time the yield curve could be signaling the extreme policies the Federal Reserve undertook to drag the economy out of the financial crisis, and while the Fed is raising rates it is not yet "tightening." Many strategists say it is simply the Fed’s rate hiking cycle flattening the curve, while inflation is not picking up that much, and there’s fear the economy may ultimately not prove strong enough to withstand all the interest rate hikes it plans. Those arguments are used to explain why the 10-year yield is not much higher than 2.84 percent, and have also led some to believe the Fed will stop hiking if it looks like the curve will invert. At the same time, the 2-year, which hit 2.57 percent Friday, is rising as the Federal Reserve looks set to move forward with interest rates hikes. Besides super low global rates, the 10-year reflects the fact that the Fed still has a huge balance sheet although it is gradually shrinking it. “i think some of the folks out there are definitely thinking the Fed will do no more than one or two more hikes, and then stop. There’s going to be disappointment. That’s not the signal the Fed is sending. I’m inclined to believe the Fed .If it does that, it will keep pressure on the curve to flatten, but probably not much more,” said Michael Schumacher, director of rate strategy at Wells Fargo. Goncalves said the Fed will keep going with hikes. "The Fed's going to go through with it anyway. The hiked through an equity meltdown in 2000. The bond market is sounding the alarm, but the Fed is not going to be running to what it perceives to be a false alarm initially, even if things go up in smoke," he said. Schumacher said he doubts the yield curve is a good forecaster for the economy, and it will not be until the Fed whittles down its bond portfolio. He said in the years between 1988 to 2008, when the 2-year and 10-year yields inverted, it generally led recession by 24 months. Schumacher said there is an event that could send those back end yields higher—the Treasury will announce its refunding needs on Aug. 1, and that could be an announcement that reveals more longer term debt issuance, which could send rates higher. “It really boils down to this mismatch between supply and demand on the back end of the curve,” said Schumacher.